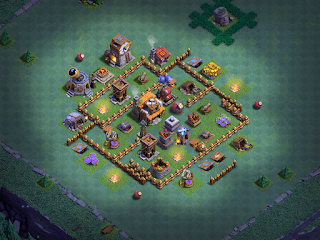 The first three levels of the Builder's Base (BB) are brutally boring. I flat out do not like the opening of the game; it's no fun at all. The fourth level starts out the same, but finally starts to get decent when you have four camps and your Boxer Giants upgraded to level 8. At that point, you can carry three to a camp and they are finally strong enough to take a beating. My standing army at BH4 is 2 camps each, Boxer Giants and Sneaky Archers. Properly deployed, this army gets me through much of BH4. I save up elixir and gold, raiding like a maniac while the BH is upgrading to level 4, then I immediately upgrade elixir storage, raid again, and buy the fourth camp. After that, all of my elixir goes into the Boxer Giant upgrades just to get the extra unit. It really is a game changer, especially when you face so many BH5 opponents. After that, I focus on Beta Minions to level 6 for the same reason (adds 2 units to camps), Bombers to level 4 (adds 1 unit to camps), then Sneaky Archers to level 8. It isn't until after these are done that I actually upgrade the Barracks to get the Baby Dragon (BD). BDs are a great troop...once they'very been upgraded to level 10 at BH5. They're next to useless at BH4 until you get them upgraded to level 8 and even then they only work out every so often. If you just want to get a few spammy wins done and out, they'll work ok but I've found them more frustrating and frequent losers at BH4, so I tend not to use them as much as say Beta Minions or my regular Boxer Giants and Sneaky Archers. Before I pull the trigger on BH5, though, I always max every single troop. Everything changes at BH5 and BH6; the troops actually become powerful enough to allow for multiple strategies, hybrid armies, and some real raiding. You also get the Cannon Cart, but you only ever get 2 per camp and, to be honest, it's a pretty much useless troop. After hundreds of battles now, across seven different games, I've only seen it used a few times (and all were losses). The increased power of the level 10 troops and their increase in camp size, represent a massive improvement to the player's ability to really get in and play. It's the first time the game is fun because you can change things up a bit, experiment with different troop combos, and play with the AI. This is especially the case when you get the Battle Machine, the BB's hero. Like the other heroes in CoC, the Battle Machine is a lightweight when he's first introduced to your battles. He acts more as an oversized tank. At BH5, you can upgrade the Battle Machine to level 5 and get his special ability, the Electric Hammer. It takes a while to save up the elixir - 900K to repair the Battle Machine, then 1M for level 2, 1.1M for level 3, 1.2M for level 4, and 1.3M for level 5. Consider the loot cap...you're looking at essentially 3 days of raiding for each upgrade and during that time your builder will be down for a day each on the upgrades. The Battle Machine brings two attack styles to the game though. First, you can do a dump and run with level 10 Baby Dragons. This is exactly what it sounds like - you deploy your Baby Dragons in a circle around the base, leaving a suitably large opening where the Air Bombs is located, then drop your Battle Machine where he is least likely to get pummeled. At this point, you simply exit the game (completely close it) and start it again. The AI will take over and run the attack in your absence. This works on Baby Dragon level 10 with Battle Machine up through level 4 and typically yields 65% or better destruction and often two stars. I've done this and pulled three stars, 85% two stars.... Yeah, it's spammy but hey - sometimes you just want to get through the attacks, especially if you want to conserve time on the Clock Tower. The second attack style is a bit more strategic. You choose a troop combination that is appropriate to the base design and let your standard troops clear as much junk and defenses as possible. Then, usually before they die out, you deploy the Battle Machine for clean up. Particularly skilled players will trickle the troops in a little at a time - throughout and around the base - deploying the BM with the last batch of troops. This works well with any level of Battle Machine but it is particularly strong with a BM that has his ability because you can get an edge. The Battle Machine's "Electric Hammer" ability gives him Thor's hammer and a short burst of added health. That may sound funny, but it can be the difference between a two star and a three star; sometimes a lot of percentage too. I use it to plow through Crushers and get BHs. Now, if you thought BH5 was fun with all those level 10 troops and the Battle Machine's Electric Hammer, just wait until you get to BH6. BH6 introduces the Night Witch and level TWELVE (***12***) troops. The Sneaky Archer gets a serious time buff with her cloak of invisibility; drop two or three, level 12 SAs on the typical defense and they'll have it down before they even become visible to the defenses. Beta Minions get another 2 per camp, so you can attack with a whopping FORTY Beta Minions. That's just plain fun. The other troops all get buffs to their main and special attacks. They're just beast. Then there's the new troop - the Night Witch. Night Witches are interesting. Like her cousin in the main game, the Night Witch spawns attackers; hers are bats. She's a fun troop, but there's a caveat...she's absolutely useless until you get her to level 6. I've been playing with an army of 30, level 12 Beta Minions and 2, level 12 Night Witches. The standing strategy is to start the Night Witches as far away from the base as you can; they're not very resilient against ANY defenses. I particularly enjoy it when I come across someone whose base has Army Camps or some other junk buildings in the corner and that's where I drop them. (Seriously - why would ANYONE put buildings in the corner on the BB?) As soon as they start spawning bats, I cover half the base with 20-25 Beta Minions, unleash my Battle Machine, and wait for the magic. I often get three stars against other BH6 players this way. I thought I'd invented this attack but I came to find out it's actually called "Mitch" (Minion + Witch) and there's a variant where you swap one camp of Beta Minions out for Baby Dragons called "Baby Mitch". The Battle Machine gets 5 new levels and, unlike his counterparts on the main game, level 10 is just kinda...well...meh. There's just no significant difference between the level 5 and level 10 BMs. They both carry out roughly the same role. Obviously, the level 10 BM can hold out a bit longer against defenses and packs a little more punch, but it's just not enough to warrant a fast upgrade. Think about it - levels 6-10 may only take 1 day each to upgrade, but even at max loot you'll be 3-4 days generating the elixir for each one of those upgrades (1.5M, 1.6M, 1.7M, 1.8M, and 1.9M). You'll be far, far better off putting your attention to the rest of your game and using that elixir to upgrade first the Gold Storages then either Baby Dragons or Beta Minions. BH6 introduces the Roaster and some additional defensive structures. That's challenging, but this is definitely an offensive game - the troops are more than capable of handling the bases. Of course, there are calls for nerfs to the troops but the question I have to ask...why? Clearly, everyone CAN win 3 battles with these troops. You don't lose any loot when you lose a battle, so nerfs just don't make sense. There may be a need to buff a few defenses down the line but for now, level 10 and level 12 troops are perfectly balanced for the game. BH5 is where the Builder's Base game really starts to become fun. The first four levels are building to where you can actually get into the game and, to be frank, they're just a mind numbingly, boring exercise in frustration. Even though the build/upgrade times get much more lengthy at BH5 (and later levels), you can actually play the game and have fun with these troops so it offsets the wait. For the first time ever, I honestly can say I was having fun pushing trophies at BH6 once I had some decent troops in my stables. How do I find Noc's games?